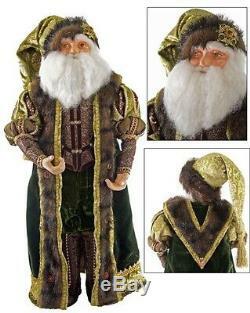 Sensational Katherine's Collection Tapestry Santa Claus Green Woodland Doll. Katherine's collection green & brown faux fur. Katherine's Collection specializes in unique handmade dolls and collectibles. The quality in their items is like no other in the industry. If an item has a Wayne Kleski tag, it was designed by him. Brand new merchandise from Katherine's Collection is not designed by Wayne Kleski. Some items were used as displays (it will be noted in listing) and others are new unopened in box. If A COA is provided it will state that in my listing or you will see a photo of it. If not stated, then the item does not have the COA. The item "Katherine's Collection 24 Tapestry Santa Claus Green Woodland Doll NEW" is in sale since Wednesday, May 30, 2018. This item is in the category "Collectibles\Holiday & Seasonal\Christmas\ Current (1991-Now)\Figures\Santa". The seller is "jpc1016" and is located in Cleveland, Ohio. This item can be shipped to United States, Canada, United Kingdom, Denmark, Romania, Slovakia, Bulgaria, Czech republic, Finland, Hungary, Latvia, Lithuania, Malta, Estonia, Australia, Greece, Portugal, Cyprus, Slovenia, Japan, China, Sweden, South Korea, Indonesia, Taiwan, South africa, Thailand, Belgium, France, Hong Kong, Ireland, Netherlands, Poland, Spain, Italy, Germany, Austria, Israel, Mexico, New Zealand, Philippines, Singapore, Switzerland, Norway, Saudi arabia, Ukraine, United arab emirates, Qatar, Kuwait, Bahrain, Croatia, Malaysia, Brazil, Chile, Colombia, Costa rica, Panama, Trinidad and tobago, Guatemala, Honduras, Jamaica, Bahamas, Viet nam.